At this stage, every game is huge. But for Liverpool, there is always an extra edge and determination when Chelsea come to Anfield. The two sides have played out some epic battles over the last 20 years or so. Unquestionably, the most painful for Liverpool fans happened almost exactly five years ago. On April 27, 2014, Jose Mourinho’s Blues snatched a 2-0 win at Anfield, shattering Liverpool’s hopes of a first Premier League title. Now, though, the Reds seem a stronger, tighter and more mature unit. Manchester City keep on winning but Jurgen Klopp’s men have stayed with them every step of the way. And Chelsea represent just the latest in a series of stern title tests. Here, we give you the lowdown on them ahead of Sunday’s showdown. Chelsea have endured an up-and-down first season under Maurizio Sarri. The Italian’s unwavering faith in a particular tactical system has had its teething problems, but there have been signs recently that a corner has been turned. A 2-0 defeat to Everton was damaging but the five-time Premier League champions have responded with three straight league wins, seeing off Cardiff City, Brighton and West Ham in increasingly impressive fashion. They also negotiated a tricky trip to Slavia Prague on Thursday night, winning 1-0 to put one foot in the Europa League semi-finals. Well-placed to secure a place in the top four, Chelsea know three points at Anfield would be a massive step in the right direction and would offer further credence that the players are beginning to respond to Sarri’s methods. As an added incentive, it would also crush Liverpool. Under Sarri, Chelsea have always sought to dominate and entertain. While they haven’t always been successful in either department, they remain one of the most dangerous sides in the country. When they turn it on, they can be incredibly effective. 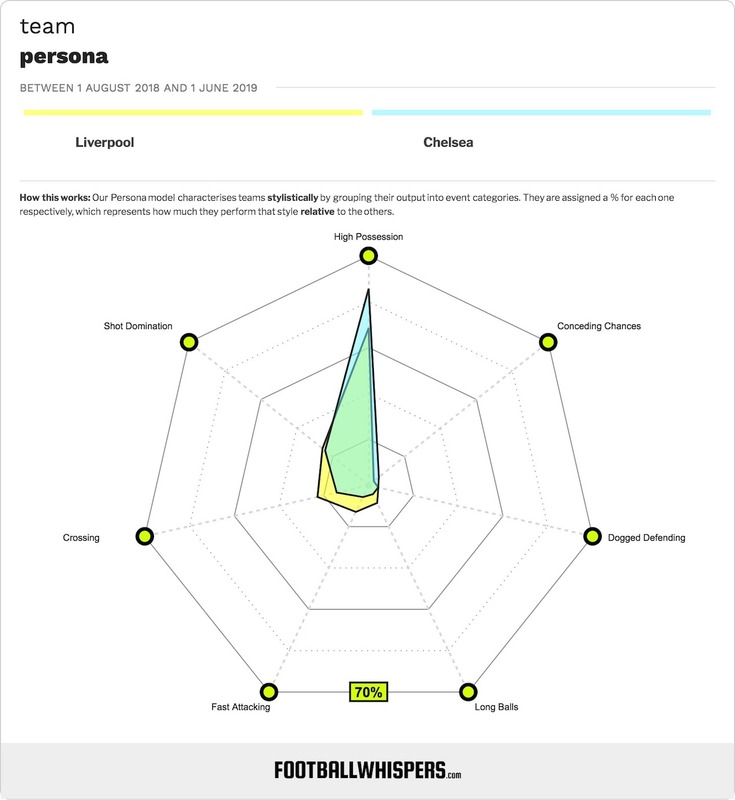 Sarri relies on the distribution skills of centre-backs David Luiz and Antonio Rudiger, the metronomic presence of Jorginho and the fluidity and penetration of Eden Hazard up front. When these separate cogs operate at maximum efficiency, they have enough firepower to tear teams apart. Chelsea are largely characterised by verticality in possession. In other words, they pass the ball forward. Their 194 forward passes per 90 is the highest in the league and they regularly look to unlock the opponent’s defence, with 3.84 through balls attempted per game. To compare, Liverpool have averaged 2.6 this season. 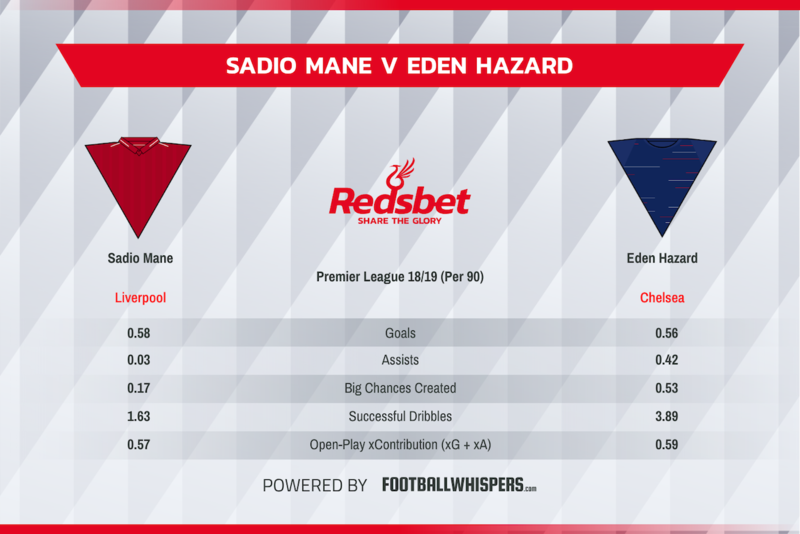 Liverpool are as well-equipped as anyone to stop Chelsea from playing their game but Virgil van Dijk will need all of his defensive nous to stop an in-form Hazard. One of Chelsea’s vulnerabilities is winning the ball in the air. They are the lowest-ranked team for aerial duels won per 90 with 14.0, compared to Liverpool’s 15.7. They also have a tendency to crumble at the back, a sign of the weakened mentality that has plagued them in the bigger games this season. Indeed, they shipped six at City, four at Bournemouth and were simply woeful in November’s 3-1 defeat to Spurs at Wembley. Getting caught on the counter is a common theme, especially if N’Golo Kante gets caught higher up the pitch, which leaves the fairly immobile Jorginho exposed. Although they have evolved since then, there will always be question marks over Luiz, especially against a side that presses and wins the ball as efficiently as Liverpool. As mentioned earlier, Hazard has been in ominous form (it’s almost like he’s trying to bag a lucrative move to Real Madrid). The Belgian was rested for the trip to Prague on Thursday so should be raring to go at Anfield. This has been Hazard’s most productive season in England, with 16 goals and 12 assists underlining how difficult it will be to replace him if he does jump ship to Real. Hazard already has two goals against Liverpool this season. The first, in the Carabao Cup, was a lethal solo effort. The second, three days later in the league, saw him supplying the finishing touch to a flowing team move. He scores every type of goal and it will take a mighty shift to stop him on Sunday. But Liverpool have their own deadly weapon in Sadio Mane. The Senegalese forward has regularly upstaged the other two members of the club’s vaunted attacking trident this season, his 17 goals putting him firmly in the hunt for the Golden Boot. Interestingly, Mane hasn’t scored for Liverpool against Chelsea in five attempts. He did, however, put two past them during his Southampton days. The 27-year-old has taken his game to a new level this season, though, and is as likely a matchwinner as anyone. Klopp doesn’t have the greatest record against Chelsea. Since earning his first win as Liverpool boss with a 3-1 defeat of the Blues in October 2015, he has won just one of eight but is winless in his last five. Chelsea, regardless of inconsistency and managerial uncertainty, should never be discounted. Fighting for a place in the top four, they will come to Anfield to win. Although we don’t think Liverpool will fall to a defeat, we can see this being a score draw.